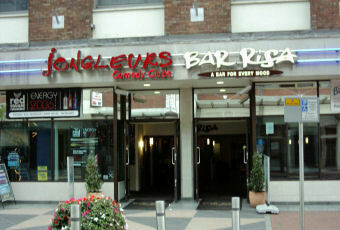 General information: Jongleurs comedy club is upstairs. Ive only ever been to this pub during the daytime so i wouldn't like to make any comments about the night life of this bar. Is a nice bar but its not called Risa anymore think its rewind if i remember correctly. Very spacious but still warm. Wide range of spirits and bottled beer which is nice. More of a young persons bar though i feel but still rate it as good. Not called Risa/Jongleurs any more. There is still a retro music bar and comedy club. satadays are also great value for drinks with buy on get one free from 9 to 11 and the entrance fee is cheep too unlike other clubs which charge the earth, and with amazing drinks deals throughout thbe week it is often cheeper to start yoyu evening here than in other bars such as weatherspoons. in all Risa and Joungleurs provides a totally different night to other bars in reading with a great mixture of music on both floors and frequent special events and extreamly competative pricing. Me and my girly friends were out last sat and stumbled upon Risa. The bouncers were really nice and friendly which makes a change after being in most other places. The drinks deals aren't too shabby either! Me and my friends were boogying away, having requests put on by the charming DJ. The atmosphere was brilliant, and the staff were amazing. I had my eye on the tall bearded barman for most of the night, he was soooo cute! Me and the ladies will definitely visit again!